When is a Gatwick airport hotel not a Gatwick airport hotel? When its Stanhill Court; a historic country house, set in more than thirty acres of grounds, with unique bedrooms, filled with character, and a fantastic restaurant, all within easy reach of both Gatwick terminals. Stanhill Court was originally built in 1881 as a family home for the Scottish landowner and Lloyds of London underwriter William Young. 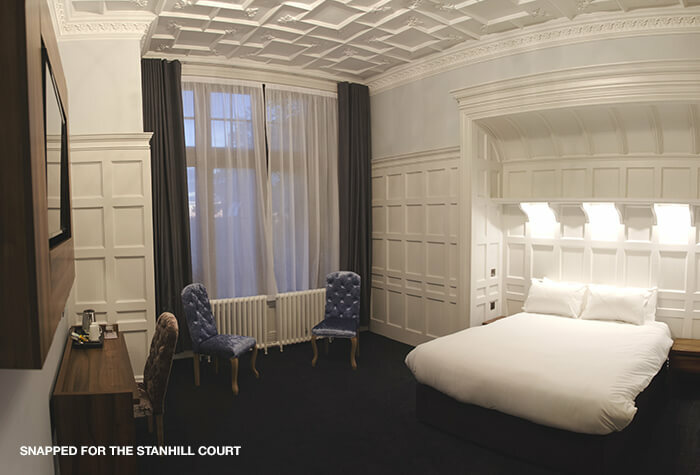 The hotel has a warm feel thanks to the carved, pine panelling throughout the hall, minstrel's gallery and barrel roof. There's also a gorgeous window of original stained glass, which depicts the family coat of arms and adds a unique 'wow' factor to the lobby. 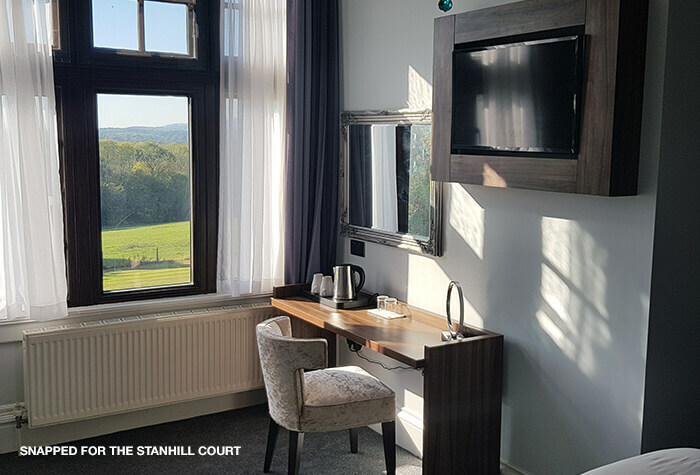 Set in 32 acres of gardens, with a further three acres of forest, Stanhill Court has country views from every window, and feels a world away from those hectic runways. The atmosphere here is of understated class, with high-quality furnishings, décor and food, and an emphasis on superior service. For those travelling to Gatwick airport by car, Stanhill Court is an excellent choice. 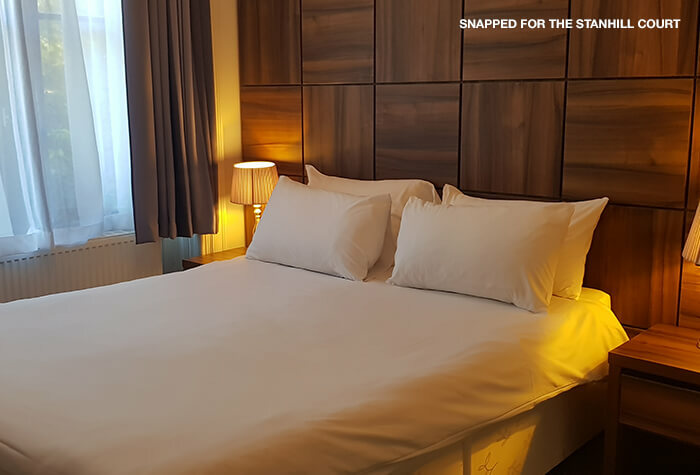 The hotel is located just a 12-minute drive from junction 10 of the M23 and an easy 10-minute drive from both the north and south terminals, yet offers a country atmosphere to help you relax and get into the holiday mood. 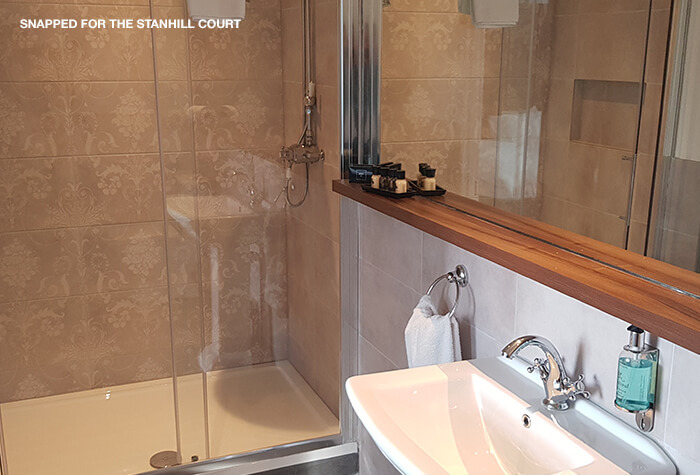 If you choose to stay at Stanhill Court, your best parking option is to leave your vehicle in the hotel's secluded, on-site car park for the duration of your holiday. To get to the airport, simply have the hotel book you a taxi for a flat fee of £10. If youre coming by public transport, Gatwick airport and Horley train station are both about a 10-minute taxi journey away. 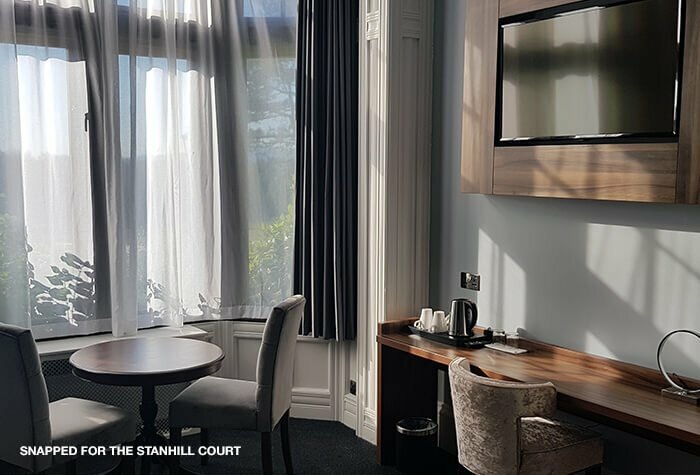 Staying at Stanhill Court allows you to start your holiday early, with a memorable dinner in the high-quality Restaurant 1881, which offers truly excellent table dhote dining and has been awarded two AA rosettes. The hotel also has a Patio Bar, which serves a simple menu of sandwiches and mains and is open until 11.30pm for drinks. Theres also free wifi throughout the hotel and a cosy library just off the lobby  the perfect place to enjoy a nightcap. 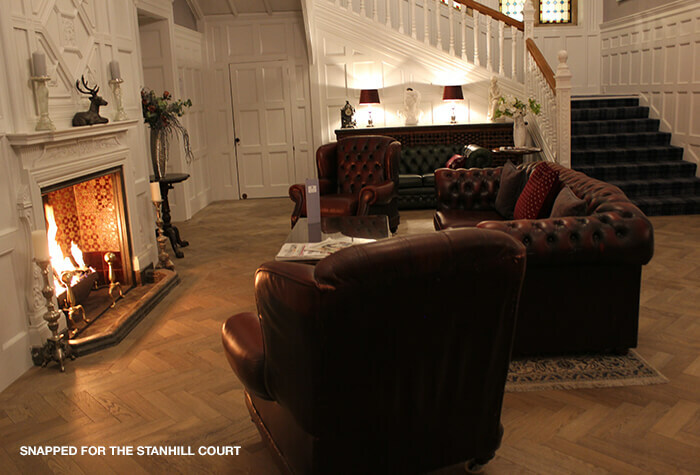 Character  Stanhill Court is a beautiful 19th-century family home, which has been well maintained and faithfully renovated into a hotel bursting with character. The lobby and lounge area has real 'wow' factor, with wood paneling and stained glass, and the rooms exude period glamour with dark wood, antique furniture and high-quality fabrics. This is not just any airport hotel, this is a genuine country house that's your home for the night. 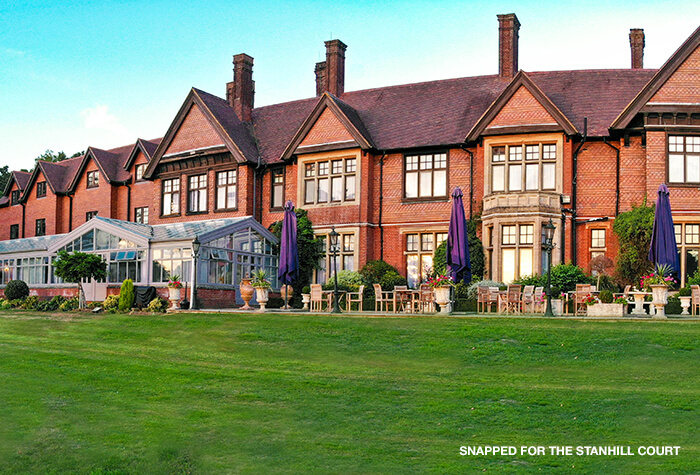 Food and drink  The food at Stanhill Court would put many top London restaurants to shame. Restaurant 1881 holds two AA rosettes and offers a very reasonably-priced table dhote two- or three-course menu for both lunch and dinner. The bar also serves a selection of hot and cold meals, and the lounge area is a relaxing place to start your holiday with a fine wine from the hotels extensive list. 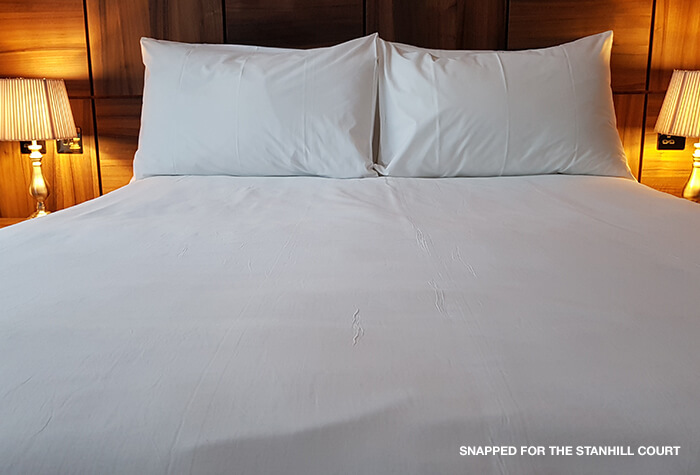 Nature  Just because you need to be close to Gatwick airport the night before your holiday doesnt mean you need to be sleeping right on top of it. 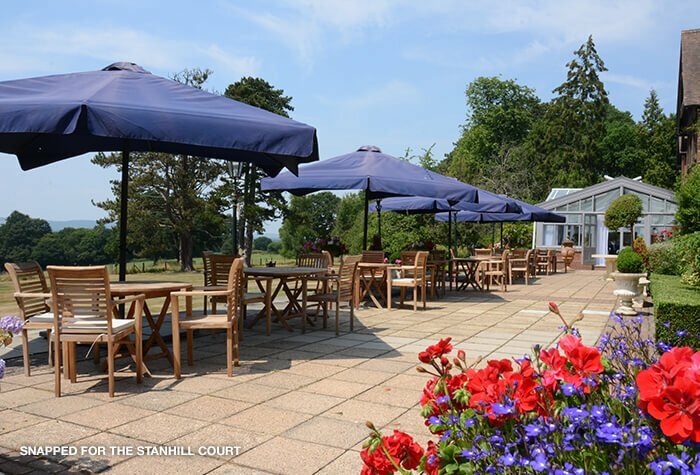 Stanhill Court is located in 35 acres of beautiful grounds and features views of the South Downs and surrounding woodlands, yet its just a short 10-minute drive from both the north and south terminals. You wont see planes taking off from your window; instead youll enjoy a country atmosphere in an unbeatable Gatwick-adjacent location. 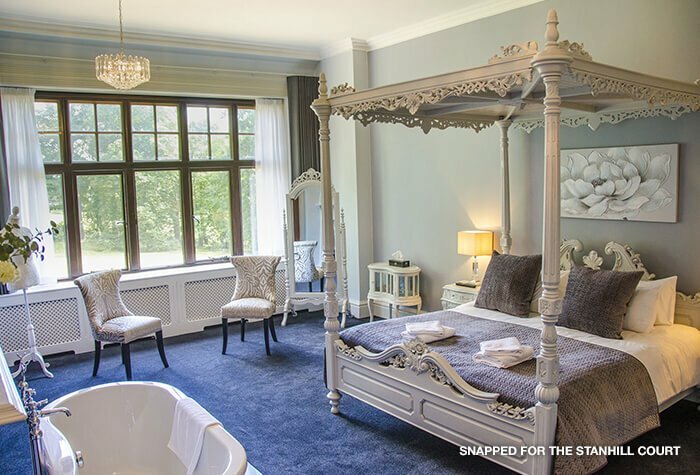 Couples  The rooms at Stanhill Court, especially the four posters and character rooms, have a romantic and relaxing atmosphere, and Restaurant 1881 is a fairytale dining room, perfect for couples, thanks to its historic fireplace, chandelier and candlelight. Couples can also head out into the grounds to stroll hand in hand and get cosy over drinks in the wood-paneled library. Standard rooms are all slightly different - some have fireplaces and others have roll top baths. There's free wifi and tea & coffee making facilities in all rooms and double size beds. The hotel can book a taxi to take you to the airport in the morning for £10 per car (2 people). 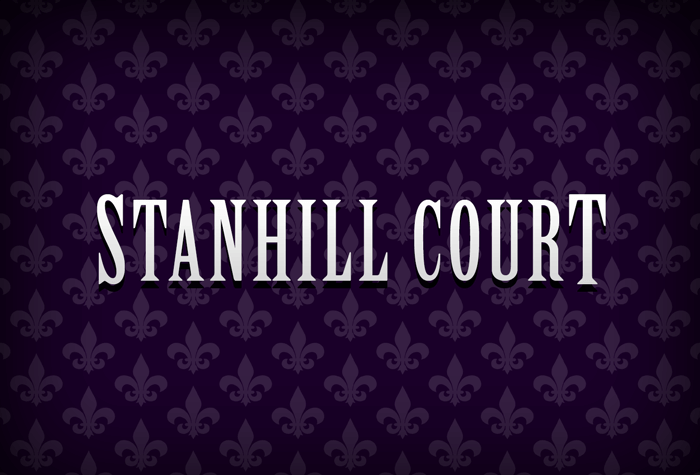 The Stanhill Court is 15 minutes from both terminals in good traffic. Driving instructions and a postcode for satnavs will be on your confirmation. Overnight parking is available if you need it - its free for guests. Check-in: from 15:00. Check-out: by 10:00. Check-in is closed between 00:00 and 07:00. Theres free wifi throughout the hotel. Our customers say its average speed and can be fairly slow at busy times. We recommend using 4G if you need a faster connection. Standard rooms are all slightly different - some have four-poster beds and fireplaces and others have roll top baths. There is no lift at the hotel, so ask reception for a ground floor room or for help with your bags if you need it. Get 2 courses for £24 per person or 3 courses for £29 when you book dinner with us. Its a set menu in the AA Rosette-winning Restaurant 1881, which serves classic British dishes made with fresh, home-grown ingredients. Open from 19:00 to 21:30. The Patio bar serves lighter meals like sandwiches and salads. A sandwich costs about £6.50 on average. The bar also serves hot and soft drinks, beer, wine and spirits. Open from 11:00 to 14:00 and 17:00 to 21:30. Breakfast is cooked to order and costs £12.95 per person. You can choose from a wide selection of English and continental items. There is no lift but accessible rooms are available on the ground floor. Accessible rooms have hand rails, grab bars and wet rooms. If you would like to request an accessible room please call Holiday Extras before you book. This hotel is not suitable for passengers arriving after midnight, as the reception closes at this time. Disabled facilities There is no lift but accessible rooms are available on the ground floor, which have handrails, grab bars and wet rooms - if you would like to request an accessible room please call Holiday Extras before you book.